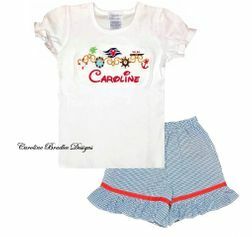 Girl's Disney Cruise Shirt-Disney Cruise Outfit-Disney Cruise Minnie Mouse Outfit-Cruise Minnie Mouse Shirt, Shorts or Capris Outfit. We start with a white shirt and embroider it with a Disney cruise monogram border with the Disney cruise logo, cruise ship, life ring, anchor and wheel. 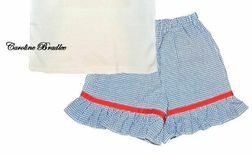 If you choose a shorts or capris outfit, we make both out of royal blue gingham seersucker with ruffles and red scalloped ribbon sewn just above the ruffles. 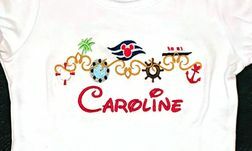 We monogram your little one's name in red Disney font under the cruise design.